LYNNY'S DEFINITELY NOT IN KANSAS LAH! Originally from Manchester in the UK, we spent 6 years in CT before moving to Leesburg in Northern Virginia. My husband's job brought us the opportunity to live in Singapore for awhile. Since 2011, we have been living in and exploring "The Little Red Dot", as Singapore is affectionally known. I decided to set up this site thinking it would be an easy way for our family and friends to see photos, and follow us as we embrace this new phase in our lives. Somehow, it has morphed into something more, something I really enjoy creating. Having never done anything like a blog or website before it is a complete learning curve for me but I am embracing the challenge, learning a lot as I go. Who says you can't teach an old dog new tricks!! Me and my wonderful hubby! 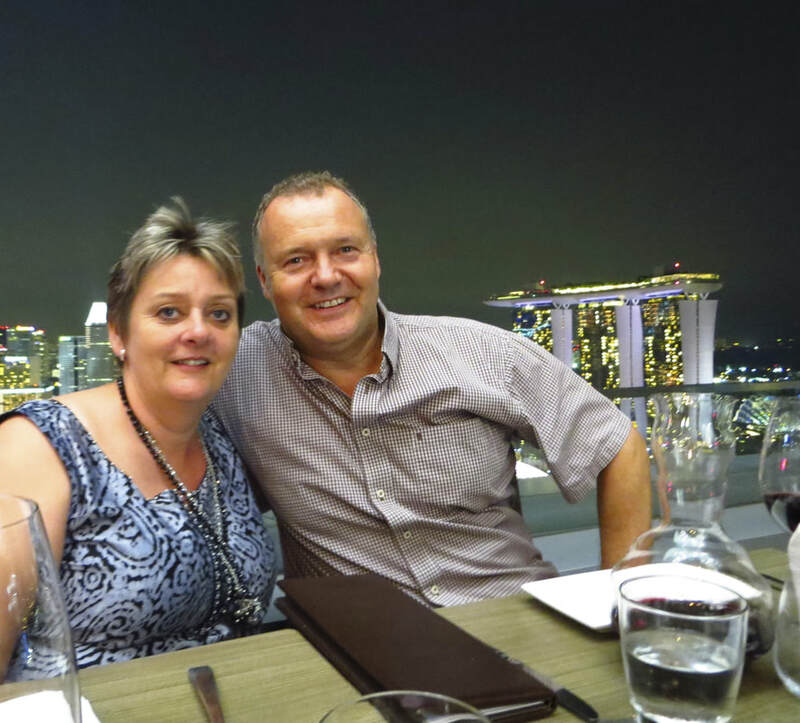 I hope you enjoy my adventures in Singapore and the surrounding region, which I have been fortunate to explore. That, along with frequent hops back to the USA to see my wonderful grown up kids, side trips back to the UK to see family, gives me plenty to document here on my website. Thanks for dropping by. WHY THE NAME IT'S LYNNY KANSAS? A lot of people ask me about the blog's name, why It's Lynny Kansas? Am I from Kansas? Well, here is the scoop. Way back in the late 90's when I was living in Glastonbury CT, we had some really good friends who had a mischievious little girl called Megan. It was Halloween, and I dressed up as Dorothy from the Wizard of Oz, although with a twist- Dorothy was older now, hence the blacked out teeth, wider waistline and the empty basket because alas Toto was now dead!! After seeing me in the costume, Meg started calling me Lynny Kansas every time she saw me. Somehow it just stuck and her whole family started calling me by the nickname, and they still do all these years later. Lots of people call me Lynny anyway so it just seemed fitting to use my funny nickname as the title of this blog. So there you have it - Lynny has never even been to Kansas!